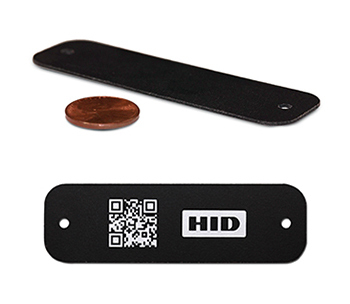 The latest product from HID Global is an extremely thin yet rugged UHF RFID tag that can be mounted with adhesive or screws, or permanently embedded in custom housings or plastic assets at the point of manufacture. Thanks to its high quality epoxy encasement, which reliably protects the internal electronics during the high temperature and pressure of injection molding processes, the tag can become invisible integral part of newly produced RFID enabled plastic containers. Despite a thickness of only 1 millimeter, the Epoxy Tag UHF is capable of surviving the harshest environmental factors, strong and prolonged presence of moisture, temperature extremes, high-pressure & high-temperature wash-downs (IP69K), repeated autoclave cycles, aggressive chemicals, challenging mechanical stresses. Tuned to perform on non-metallic surfaces, such as plastic, wood and glass, the Epoxy Tag UHF is well suited for a broad range of asset tracking applications in manufacturing, healthcare and waste management. This thin and rugged UHF RFID tag features the Alien Technology Higgs-3 chip and comes in a single frequency version for being used across all world’s regions. Upon request, the Epoxy Tag UHF can be supplied with self-adhesive back, in customized dimensions, with other operating frequencies (LF, HF). It can also be printed with custom logos, barcodes or human-readable data. Interested in more details on this thin rugged UHF RFID tag? Please contact HID Global. Looking for other type of RFID tags? Give a try to our RFID tag search engine or contact us at info@veryfields.net, also for suggestions about complete RFID solutions.